There is no written language for Australian Aboriginal People so in order to convey their important cultural stories through the generations it is portrayed by symbols/icons through their artwork. It is imperative to pass on information to preserve their culture. These vary from region to region, they are generally understood and form an important part of Australian Indigenous art. Symbols are traditionally used as an important part of contemporary Aboriginal art. Here at Artlandish we have a wide variety of paintings that use contemporary and customary icons. The Aboriginal people have for thousands of years used artistic designs and symbols to convey stories and messages which are incredibly important in their culture. The iconography used when applied to any surface – body or object then covert it to having religious or time honoured meaning. 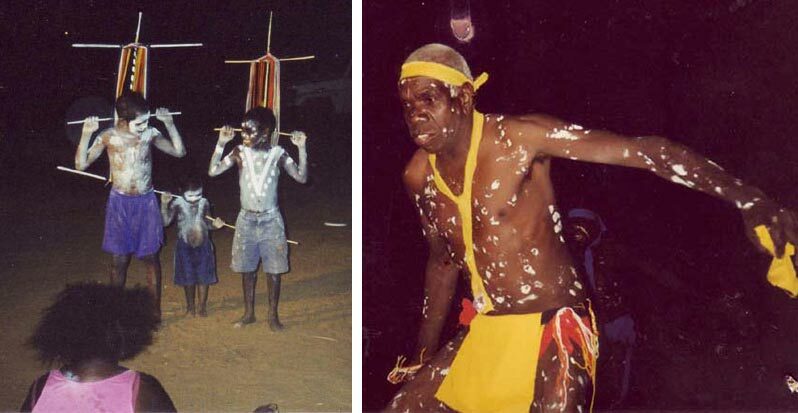 Body paint used in important ceremonies has special meaning to Aboriginal people. The symbols used are specifically chosen for certain ceremonies of religious significance to the community. 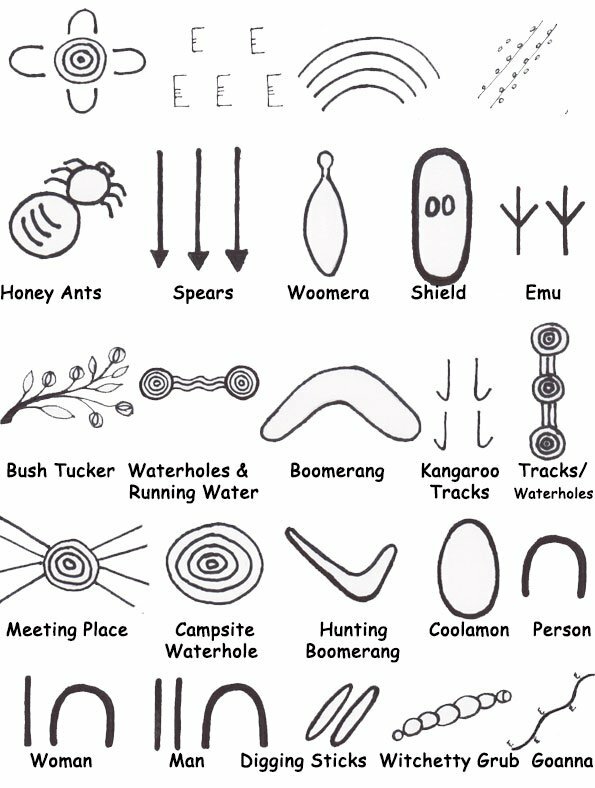 Most of the symbols used in Aboriginal iconography are relatively simple but to tell a more complex story they are used in more elaborate combinations. In a Water Dreaming painting to give an example, a U shape symbol is used for a man but if he is sitting next to a water hole, concentric circles would be incorporated and spiral lines showing running water. The artist is telling a story that the man by the waterhole “the waterman” is summoning rain to come. Artists today will denote the “outside” story which they prepare for their non-indigenous audience whilst the full “inside” story can be understood only to those with the appropriate level of knowledge. Traditional aboriginal dot paintings represent a story, generally regarding hunting or food gathering and usually have traditional aboriginal symbols imbedded throughout the painting. These symbols, when explained, give a completely whole new meaning to the painting. Western Desert art is given its unique character by the use of dots. Dots symbolise stars, sparks, burnt ground etc. as the base of an Aboriginal painting is the organisation of the earth and the ancestral connection with it. In the last 30 years of the Western Desert movement, Johnny Warangkula was the first to use dotting in his paintings as a background. Other painters then followed as his work was so admired. Artists from Papunya (then later Yuendumu and other central desert communities) adopted his style and conventions. In time the Papunya painting movement of the 1970s began to obscure or hide the meanings of some symbolisms through the use of dots to those who were not privy to it. It is therefore ironic that the technique of using dots, that many Western people regard as characteristic of contemporary Central and Western Desert art was in fact to obscure certain revered knowledge. The artists developed a way of avoiding or hiding their secrets/meanings to the marketplace to protect their people. The dots, which became much more prominent from the Papunya region from 1973, are really quite important in more ways than one. In contrast to Aboriginal Artists, European artists use an easel, which holds the canvas upright in front of the artist, so that the artist may see both the original subject (e.g. a landscape) and the easel with the painting or work in progress. 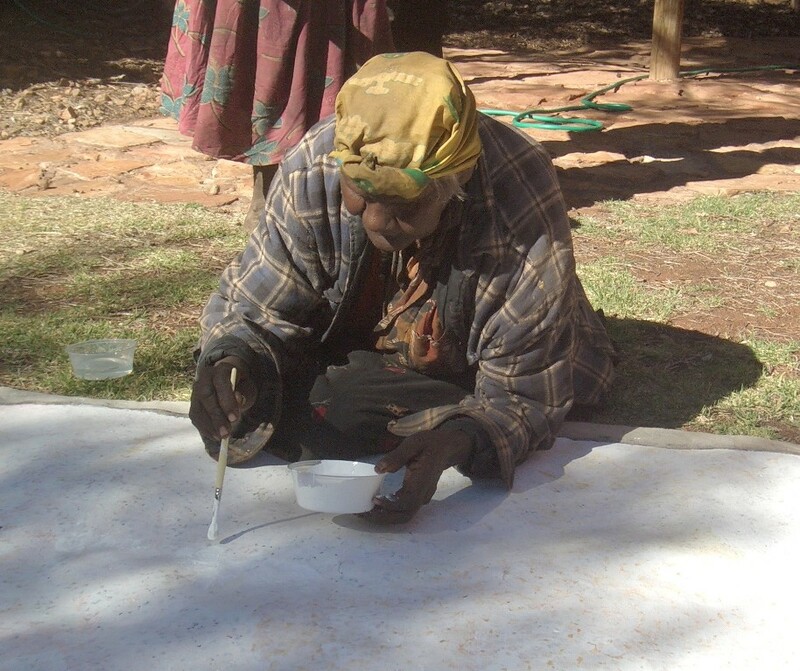 Aboriginal artists usually lay the canvas on the floor or ground, and from there, using their arms to support them, apply “Dots” of various coloured paints/ochre to depict a subject which is impregnated in their mind at the time. Current artists in vogue include Gloria Petyarre, Jeannie Petyarre, Dulcie Long Pula and Mary Rumble popular for their iconic representation of Medicine Leaves, Reggie Sultan, Tarisse and Sarrita King, Anna Price Petyarre, Gabriella Possum Nungurrayi, Michelle Possum Nungurrayi, Eddie Blitner, Rusty Peters, Ju Ju Wilson, Mark Nodea and Tommy Carroll amongst others. 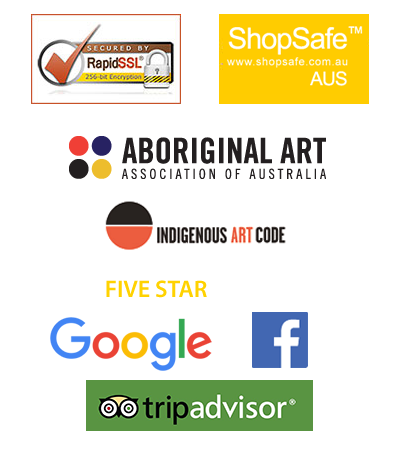 When next admiring a beautiful piece of Aboriginal art we are sure you will experience a whole different appreciation and understanding (but not too much 😉 ) of this remarkable art form that we have been so privileged to experience.